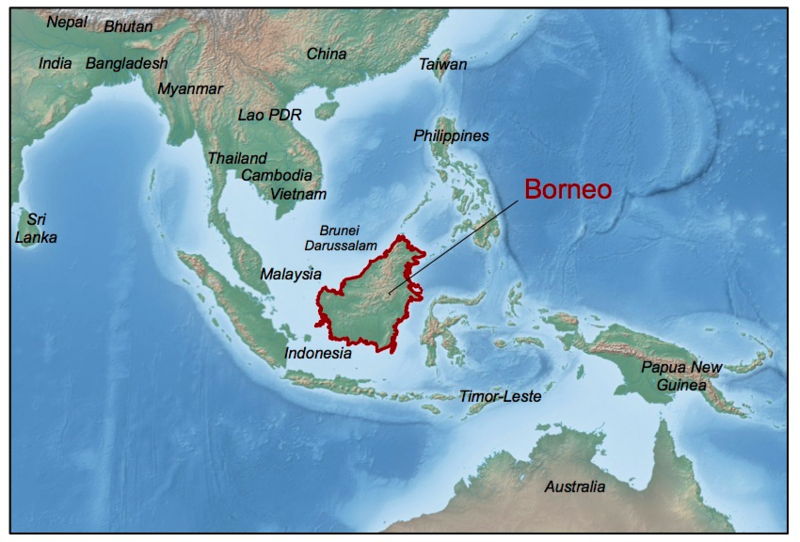 Planning for Borneo’s landscapes needs to incorporate diverse social and environmental issues, so we have developed new approaches to spatial planning to enable simultaneous optimisation for social and environmental objectives, to understand their trade-offs and synergies, and account for the contribution of a diverse range of land uses and activities to meeting these objectives. We are working closely with Dr. Erik Meijaard, The Nature Conservancy, and other partners to extend and apply these methods, to help meet objectives for biodiversity conservation, ecosystem services, and equitable development, and to help make planning and decision processes more transparent and sustainable. Our projects include research in East & North Kalimantan (projects 1,2,5, in orange), Berau regency within East Kalimantan (projects 2,4, in yellow), and the Ex Mega Rice Project in Central Kalimantan (project 3, in brown), and we are contributing to the Borneo Futures Project, which is a network of collaborations for research and communication across the island of Borneo. 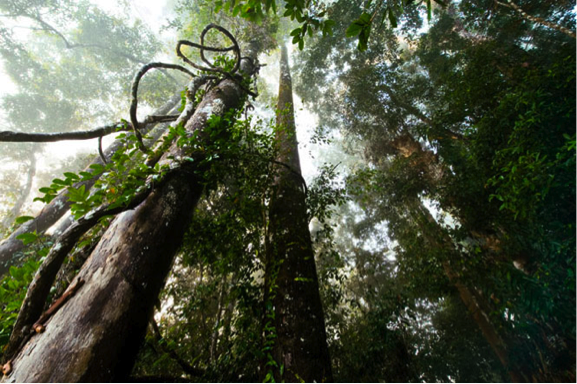 Using East Kalimantan as a case study, we are prioritising degraded forest for restoration and determining which restoration actions should be implemented across multiple ecosystem types, ranging from mangrove forest to montane forest. We are developing a forest restoration scenario that will be simulated using a combination of non-spatial and spatially explicit optimization algorithms. We will use a simulated annealing algorithm to optimize ‘where’ different restoration actions should occur with the objective to minimize the overall costs of restoration while achieving pre-defined targets for each restoration action. The targets for each restoration action will be determined using an exhaustive search algorithm to determine ‘how much’ of each restoration action should be allocated to ‘which’ restoration zones, in order to maximize the recovery of features (i.e. carbon sequestrated and mammal habitat restored) given particular levels of resources (e.g. budget, area extent). This project quantifies flows and benefits from water-related ecosystem services, and incorporates these services into spatial planning, together with objectives for development and biodiversity. These ‘water-related ecosystem services’ encompass the supply of freshwater(its quantity, quality and timing), prevention or mitigation of damage from water flows (e.g. 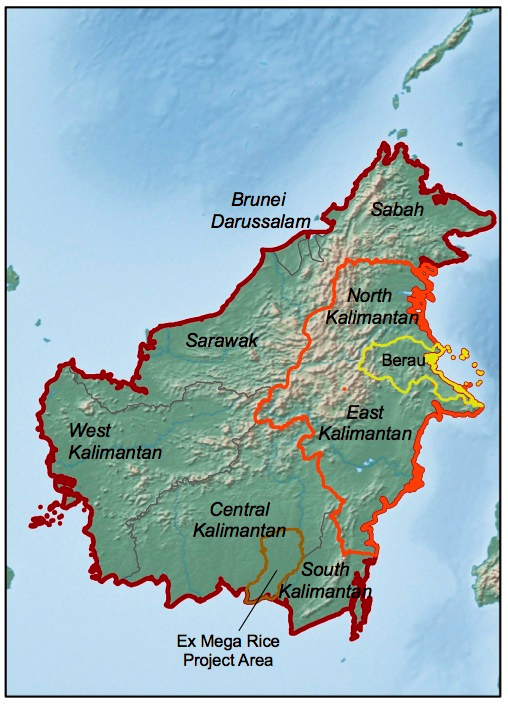 flooding, erosion), and regulating movement of sediments or nutrients, and the study considers three spatial scales: Kelay-Segah watersheds, Berau river basin, and East Kalimantan. Wells, J.A., Meijaard, E., Abram, N.K. & Wich, S.A. (2013). 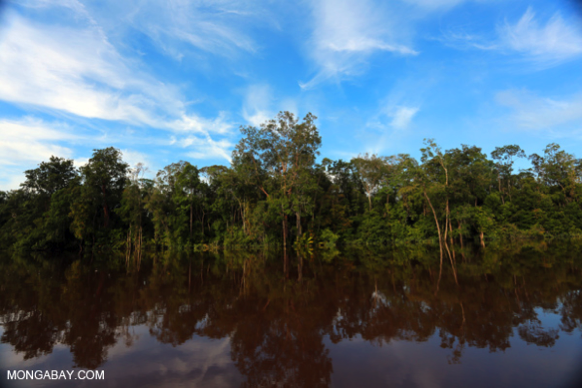 Forests, Floods, People and Wildlife on Borneo. United Nations Environment Program, Nairobi, Kenya. Our overarching goal for this project is to answer the question: Can a land use plan be developed that will simultaneously satisfy all the management objectives? If so, what will it look like? If not, what are the trade-offs? Our research, led by Elizabeth Law, has mapped the value of five ecosystem services (agriculture, oil palm, forestry, carbon, and biodiversity) across the study region. We define how different land use options affect each ecosystem service, and evaluate the performance of current management and existing land use plans to satisfy the targets for each service. We then apply multi-objective optimisation to evaluate the appropriateness of stated planning targets, and use this model to suggest development strategies that may help achieve them. Law EA, Meijaard E, Bryan BA, Mallawarachchi T, Koh LP, Wilson KA (In press). Better land-use allocation outperforms land sparing and land sharing approaches to conservation in Central Kalimantan, Indonesia. Biological Conservation. Drummond, S. P., K. A. Wilson, E. Meijaard, M. Watts, R. Dennis, L. Christy, and H. P. Possingham. 2010. Influence of a threatened species focus on conservation planning. Conservation Biology 24:441-449 doi: 10.1111/j.1523-1739.2009.01346.x.